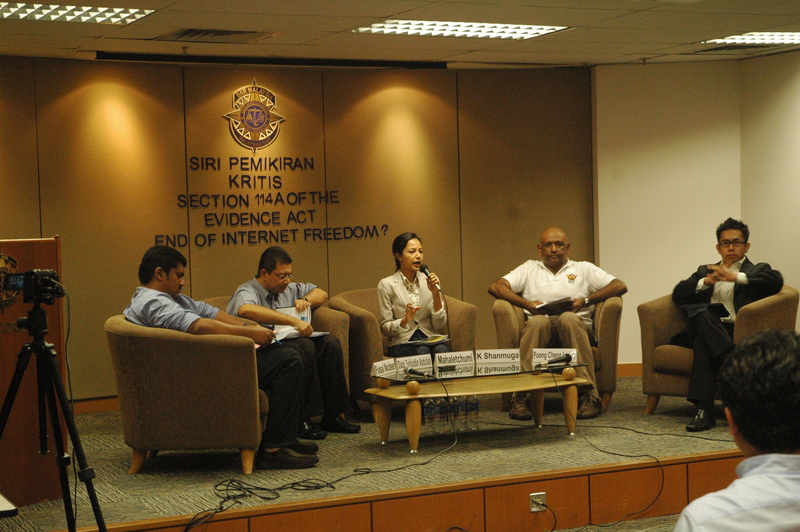 There was plenty of debate and discussion at Saturday’s “114A Evidence Act-End of Internet Freedom?” forum, much more than in Parliament at the time the law was passed! Deputy Minister Saifuddin Abdullah, a speaker at the forum, said he wished the debate at Parliament was this intense as he conceded that he himself was focused on another piece of legislation at the time. He said that if a normally conscientious MPs like Khairy Jamaluddin could be caught unawares about the effects of a law like Section 114A until after fact, what more the rest of the members of the Dewan? Much of the discussion amongst the panelists centered around the flawed process of law-making, especially the lack of consultation sessions with the public. The panelists also expressed a diversity of views on the presumptions the amendment makes and the burdens it imposes on private individuals and businesses. Faisal Moideen, a Member of the Bar, conceded that the text of Section 114A was wide but did not think the procedural rules outlined in the amendment would unduly burden the accused, reiterating that the presumption of guilt was rebuttable in court. Fellow lawyer K. Shanmuga, however, referred to Section 114A as the bluntest instrument that could have been used to combat cyber-crime and stated that the amendment was not the only or most effective solution to the problem. The forum was also open to questions from the audience. In addition to asking questions about accountability, Bloggers, Facebook and Twitter users, and those involved in the IT industry also found the amendment’s potential effects on Internet surveillance particularly worrisome. Both a systems administrator and the creator and administrator of a Facbeook group, for instance, were concerned that they would need to track the online activities of service users or commenters in order to avoid wrongful accusations made against them under Section 114A. As they entered the venue, audience members were asked to vote on whether they supported, did not support, did not care, or did not know about Section 114A of the Evidence Act. Before the forum, six individuals supported the amendment and 39 did not support it. Another round of voting took place at the end of the forum, and an astounding 57 votes were casted against Section 114A! ← Jom! Bantah Seksyen 114A! “…Deputy Minister Saifuddin Abdullah, a speaker at the forum, said he wished the debate at Parliament was this intense as he conceded that he himself was focused on another piece of legislation at the time. He said that if a normally conscientious MPs like Khairy Jamaluddin could be caught unawares about the effects of a law like Section 114A until after fact, what more the rest of the members of the Dewan? With due respect, how many more of those bills were there they didn’t look at? Were we to check Parliament voting details on the bill, it should not surprise anyone who voted for what! It gives readers those MPs and ministers were all taken for a ride if they couldn’t find time to dig in their jobs – making laws. Maybe they went for a good ride! ?